Janna: Okay you guys, this is the ultimate football food! These wings are so good, not too spicy…though I like a little fire!!! They are also sweet and tangy! Make sure you have plenty of paper towels on hand, cause it’s gonna get messy!!! I hope you enjoy this post, it’s one of my favorite things to make and I seem to never make enough!!! Start with thawed chicken, drain excess water or pat with paper towels. Put both flours, salt, paprika, cayenne pepper in a gallon size zipper bag or large bowl shake or stir to combine. Add chicken a few at a time and shake to coat until all chicken is coated in flour mixture. Put vegetable oil in pot and heat oil to about 350* F. When oil is hot, add coated chicken to oil, being careful not to splatter. Fry chicken for 6-8 minutes on each side. Internal temperature should be at least 165*F.
When chicken is cooked, drain on paper towels and set aside. Now it’s time to make the sauce. You can make this sauce ahead of time if you want, just make sure its room temperature or slightly warm or the butter in it will harden and it won’t coat the chicken well. Combine melted butter, hot sauce, brown sugar, paprika, salt, vinegar and cayenne pepper in a large bowl and whisk until smooth. Toss in chicken a few at a time, turning chicken over and spooning sauce on top to get it thoroughly coated. Place chicken on a tray or in a bowl, however you decide to serve it. I served mine with a side of ranch dressing and my friend Sarah’s Spicy Cabbage Salad (pictured at top of page) and she has let me share that recipe with you! The salad goes perfectly with the wings and is super simple to make. You can make the salad ahead of time as well, just wait until you’re ready to eat to dress it, otherwise it will get soggy. Spicy cabbage salad recipe below, enjoy!!! Mix together the dressing ingredients and then blend with an immersion blender to emulsify. Janna: I love soft pretzels. I’m a sucker for the ones at the mall that are served with piping hot spicy “cheese!” So when Joanie and I were discussing great Super Bowl food, naturally I thought of soft pretzels. They are fairly easy to make, and go great with cheese or assorted mustards for dipping. Plus you can make them the day before you need them. In this case I am pairing pretzels with beer cheese! Combine the water, sugar and kosher salt in the bowl of a stand mixer and sprinkle the yeast on top. Allow to sit for a few minutes or until the mixture begins to get bubbly. Add the flour and butter and, using the dough hook attachment, mix on low speed until well combined. Change to medium speed and knead until the dough is smooth, approximately 4 minutes. Oil a large bowl with vegetable oil, put dough into oiled bowl and turn once, coating with oil. Cover with plastic wrap and sit in a warm place for approximately 45 to 55 minutes or until the dough has doubled in size. Preheat the oven to 450 degrees F. Line two cookie sheets or large shallow pans, spray lightly with cooking spray or lightly coat with vegetable oil. Set aside. Bring the water and the baking soda to a rolling boil in an 8 quart sauce pan. In the meantime, turn the dough out onto an oiled work surface (I spray my clean counter top with cooking spray) and divide into 8 equal pieces. Roll out each piece of dough into a 24-inch rope. Make a U-shape with the rope, holding the ends of the rope, cross them over each other until each end is back where it started and press onto the bottom of the U to form the shape of a pretzel. Place onto the cookie sheet pan. Place the pretzels into the boiling water, 1 by 1, for about 30 seconds each. Remove them from the water using a large flat spatula. Return to the sheet pan, brush the top of each pretzel with the beaten egg yolk and water mixture and sprinkle with the pretzel salt. Bake until dark golden brown in color, approximately 11 to 13 minutes. Cool on a cooling rack for about 7 minutes before serving. These are easily reheated in the oven or toaster oven for a few minutes. I don’t recommend reheating them in the microwave because they will get soggy. Below you will find the recipe for beer cheese. Enjoy!! So, I did a little research on beer cheese and discovered that it originated in Kentucky in the 1940’s. It’s been a Kentucky staple ever since! I’ve put my own spin on this beer cheese, adding cream cheese for a creamier texture. Also, please note that this works best using a cheaper beer and it works best when beer is at room temperature and flat. Mine was cold so I put it in a microwave safe cup and microwaved it till room temp and then stirred it a lot to flatten it. I used Pabst in mine, you can use whatever you like! I used a bowl with emursion blender instead). Start by combining the cheddar and cream cheese in a large bowl. use emulsifier, food processor or hand mixer to blend together until creamy 20-30 seconds. Add all ingredients except beer and combine. when well blended, slowly add beer and mix. Add more hot sauce and cayenne pepper if you like it spicier. Refrigerate for about an hour. To heat, you can either microwave for about 20 seconds at a time until hot, or on low heat on stove top being careful not to scorch. 1 cup of red wine, I used Goedhart Syrah, a Cabernet or red blend would work as well. 3 cups of vegetable broth, beef broth or I used vegetable “better than boullion”, follow directions on jar to make your stock. Slice onions into ¼ inch rings or smaller, put butter into stock pot and turn heat onto med. When the butter is sizzling add the onion and salt and let sweat for a few minutes. Stir occasionally so the onions don’t burn. You will end up carmelizing the onions which will take close to an hour of cooking and stirring. Hang in there! This is what onions will look like after a few minutes of cooking and stirring. Don’t worry if you get little scorched bits. This is after about 40 minutes of cooking and stirring occasionally, were almost there! When carmelized, the onions will have a deep caramel color and be very soft. At this point add the 1 cup of wine, simmer until wine thickens (a few minutes). Add the stock, thyme and pepper and let simmer a few minutes more. Slice the baguette into about 1 ½ inch rounds, place on a baking sheet and turn oven on broil, broil for 2 minutes or until tops are golden, no need to turn. Ladle soup into oven safe bowls, place one slice of baguette into each bowl on top of soup toasted side up. Top baguette with about ¼ cup of grated Gruyère cheese. Place bowls on a baking sheet and put under broiler for an additional 2-3 minutes or until cheese is bubbly and melted. You have now made french onion soup! This recipe will make about 4 large servings. Below are Sarah’s suggestions on wine pairings. French onion soup has a lot going on. You have the sweetness of the onions, the savory herbs, the rich broth and the nuttiness of the cheese. My preference a red wine that is on the rustic yet fruitier side such as an inexpensive Beaujolais-Village or a Cote du Rhone (usually both in the $11-16 range) and if you can’t find French, the CMS Red from Hedges Family Estate is a great stand-in! White wine can also pair well with this soup, I’d go with a dry white wine from Alsace, which would offer a refreshingly chilly cleanse after a bite of this luscious soup. Just be careful not to burn your mouth on this typically mouth-searing dish, otherwise it won’t matter what you are drinking! 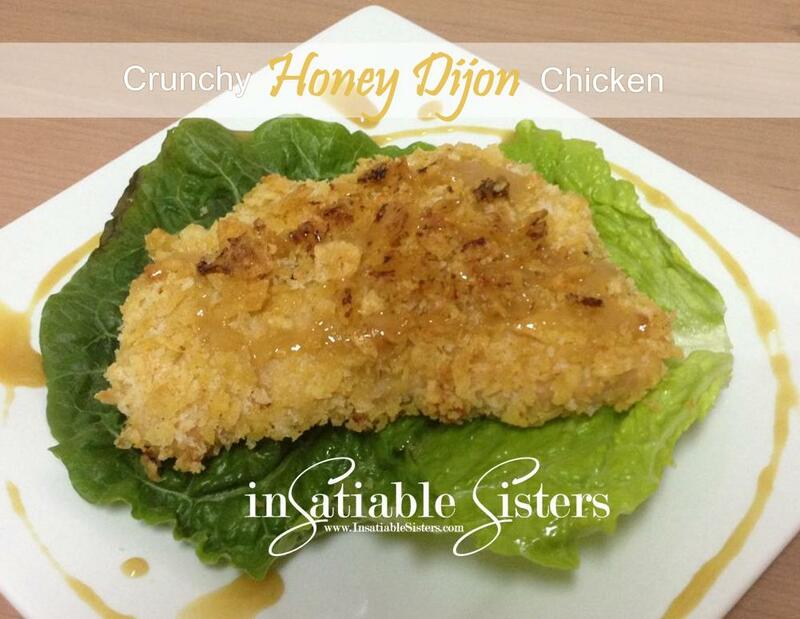 Joanie: This recipe is definitely one of my most requested! I don’t know if this qualifies as a true bruschetta since there is no olive oil in the recipe, but it’s still delicious! You could substitute olive oil in place of the butter, but I have yet to try that. This would actually be a perfect recipe to use Janna’s Homemade Butter. Start with red, ripe tomatoes. Finely dice yield approximately 2 cups. Set aside in a bowl. Mince red onion, add to tomatoes. Chiffonade basil leaves by stacking them, rolling them lengthwise, and slicing them into thin ribbons. Add basil to tomato mixture. Salt to taste. Set aside. Slice baguette on the diagonal to desired thickness. I like mine about 3/4 inch. Arrange on a baking sheet and gently toast them on broil in your oven. WATCH THEM CAREFULLY so they don’t burn. You want these to be slightly golden and crusty. They will go back into the oven for final step so don’t let them get too dark. Remove when toasted. In microwave safe bowl, add 1/2 cup of butter and minced garlic. Microwave until melted and creamy. Give butter mixture a stir, then add generously to each slice of toasted baguette. I like to make sure the garlic pieces are evenly distributed on the bread. Don’t go cheap on the butter! This adds SO MUCH flavor to the recipe. Next, use small slotted spoon to add tomato mixture to each slice of bread. Top with shredded Parmesan cheese. Place back in the oven and broil. Again, WATCH CAREFULLY! They are ready when cheese is melted and bruschetta is hot. Most of this batch was eaten within minutes, so this is all I could get for a picture! So here it is, our first blog post! This has been a long time coming, as we have been talking about putting together a cookbook for years. However, it was Janna who said “I want to start a food blog!” That idea has now become a reality and we are so excited to get started! Janna here! I’ve been thinking hard about what recipe I want to share first. I want it simple, yet intriguing…maybe a little inspiring. So I’ve chosen BUTTER. Yes, butter! 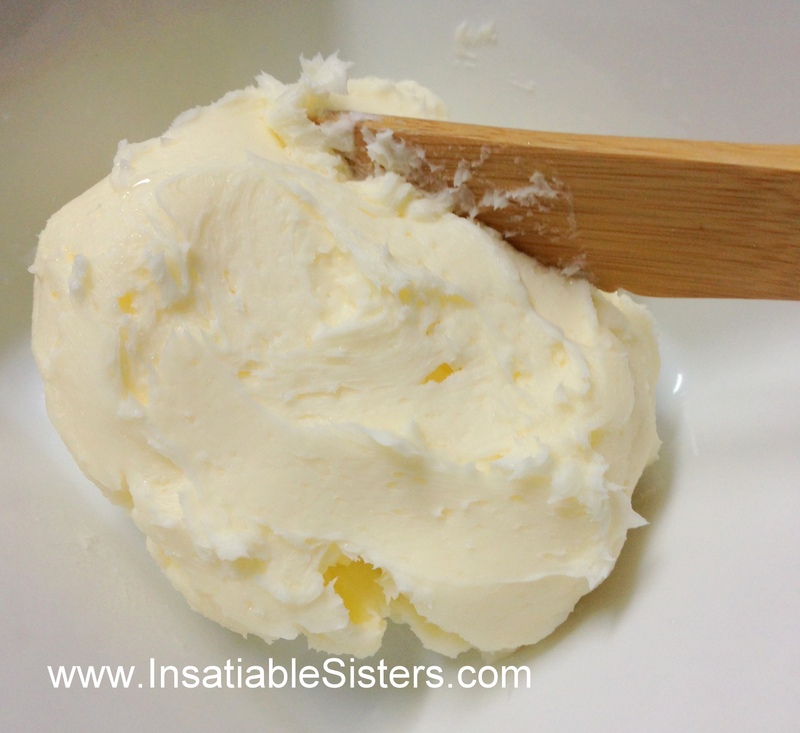 You will not believe how easy it is to make your own butter. I had just started working in the kitchen at Hedges Family Estates Winery, with Deborah Culverhouse, the Liason. Deb (as we all call her) told me we were going to make butter and I thought, seriously? Where’s the wooden butter churner and the rickety front porch? Deb pulled out her food processor and some heavy cream and it literally took under ten minutes to make delicious, creamy, sweet butter! This was only the first of many fantastic things I would learn from Deb. Put cream into mixing bowl or food processor and start on med/high. Cream will start to thicken and will resemble whipped cream in about 4 minutes. Continue mixing. The cream will “break” and the butter will start to separate from the buttermilk at about 6 minutes. The butter will look dry and grainy. The buttermilk will slosh out at this point so, use the splash guard attachment on your mixer if you have one. Drain the buttermilk out of the bowl (you can reserve it to use in another recipe). Press the butter up against the side of the bowl with a rubber spatula, squeezing excess buttermilk out. Drain off buttermilk again. Scrape butter into bottom of bowl and add about ½ cup of the cold water. Turn mixer on low for about 10 seconds. Press butter against the bowl again and drain water. Do this 2 or 3 times. As a last step, to make sure all the buttermilk and water is out, put the butter into a mesh strainer and press with rubber spatula over the sink or a bowl. Turn butter and press several times. 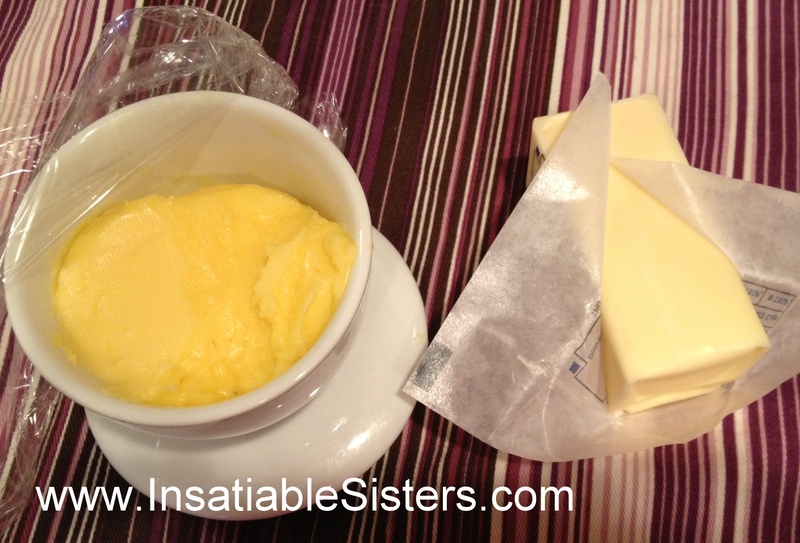 It may be useful to pat lightly with a paper towel to get all the moisture off the surface of the butter. *If you don’t have a mesh strainer, you can do what Deborah does and wrap the butter in a cheesecloth and press excess moisture out. At this point you have delicious homemade butter! Aren’t you proud of yourself? It was easier than you thought huh? I don’t make this every time I want butter because it is a little more spendy than buying it already made, but for some recipes (like homemade bread), no other will do than freshly made butter! Your friends and family will be completely impressed and will think you were hunkered over the churn all day!! If you want your butter salted, use a fine grain sea salt and stir it into the butter. a little goes a long way so start with a very small amount (a pinch) and add to taste. Here’s a couple snapshots. Top: Janna’s butter next to a store-bought stick of butter. Bottom: Joanie’s first attempt at butter. Turned out lighter in color, but still delicious!